Born in Mesa, Arizona in 1920, Wayne Thiebaud spent much of his early life in Long Beach, California. He began his career in commercial art and planned to go into advertising. From 1938 to 1949, Thiebaud worked as a sign painter, illustrator, cartoonist and publicity manager, as well as an artist for Hollywood film studios. It is not difficult to detect the influence that this commercial experience had on his later paintings; his most characteristic work depicts consumer objects, often pies and cakes, as they are seen displayed in drug store windows. From 1949 to 1950, Thiebaud studied at San Jose State University and, from 1950 to 1953, at California State University in Sacramento. He had his first solo exhibition at the Crocker Art Gallery, Sacramento, in 1951. From 1956 to 1957, the artist lived briefly in New York City, where he became close friends with the Abstract Expressionist Willem de Kooning. After teaching for nine years as a visiting professor at renowned universities around the country, he accepted a professorship at the University of California at Davis in 1960. 1962 marked the first exhibition of his work in New York, where he showed at the Allan Stone Gallery, as well as his first one-person museum show at the De Young Museum, San Francisco. Thiebaud has been associated with Pop Art, yet his early work slightly predates that of the classic pop artists, suggesting that he may in fact have had a great influence on the movement. His work possesses a nostalgic sentimentality that Pop Art traditionally lacks, and owes more to Thiebaud’s study of historical still life masters than to contemporary art movements. The true to life representation in his work marks him as a predecessor of photorealism. Thiebaud uses heavy pigment and exaggerated colors to depict his subjects, and the well-defined shadows characteristic of advertisements are almost always included. Objects are simplified into basic units, but appear varied using seemingly minimal means. Giorgio Morandi, whose contemplative, palpable and delicate works share many characteristics with those of Thiebaud, is commonly cited as an artistic influence. Thiebaud’s paintings can be found in the permanent collection of the Museum of Modern Art, New York, the San Francisco Museum of Modern Art and the Art Institute of Chicago, as well as many others in the United States and abroad. He was awarded the National Medal of Arts in 1994. In 2001, the Whitney Museum of American Art honored Thiebaud with the most comprehensive retrospective of his work to date. 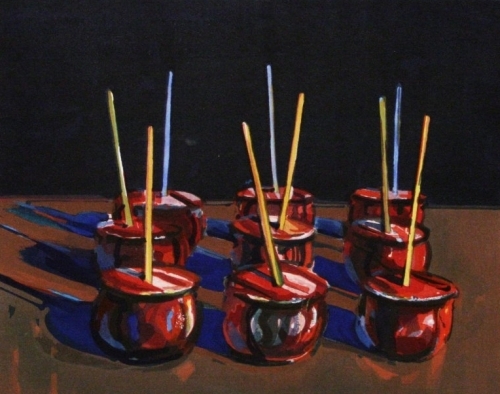 Wayne Thiebaud currently lives and works in Sacramento, California.